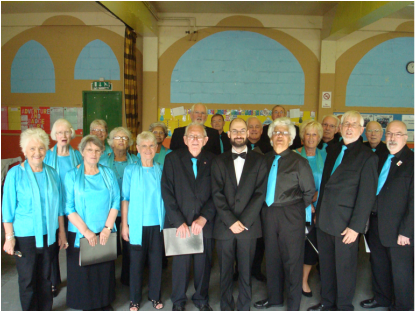 This Bristol Choir was founded in 1982 by Tessa and Frank Martin and was then known as the Filton Festival Choir. It included a group of ladies who sang as "The Filtonettes" and a men's group known as "The Filtones" whence its present name. One of its notable Musical Directors was Ken Dinham, at that time Music Master at Portway School. He was a talented musician and when he died in 1994 left a legacy of musical arrangements which the choir is still using to this day. Don't like going out in the evening? Are you at a loose end on a Wednesday afternoon? Why not come and exercise your lungs and challenge your grey cells with our friendly group of people who are The Filtones. We are actively seeking to recruit sopranos, altos, tenors (gents or ladies) and basses to join our happy band. We sing four part harmony but ability to read music, although useful, is not essential as we supply CDs and MP3 files as teaching aids. We give afternoon concerts to elderly people's clubs and societies and two evening concerts in June and December, from which we donate much of our profits to charities. We are a very caring and sociable group of people who sing together with the aim of giving as good a performance as we can, but mainly to enjoy ourselves. Just call in at Eden Grove Methodist Church, Horfield, BS7 0PQ any Wednesday afternoon (not during August) for a listen and a chat. You can be assured of a very warm welcome!